On an oppressively hot Monday in August of 1966, a student and former marine named Charles Whitman hauled a footlocker of guns to the top of the University of Texas tower and began firing on pedestrians below. Monday, Monday follows three students caught up in the massacre: Shelly, who leaves class and walks directly into the path of the bullets, and two cousins, Wyatt and Jack, who heroically rush from their classrooms to help the victims. This searing day marks the beginning of a relationship that will entangle these three young people in a forbidden love affair, an illicit pregnancy, and a vow of silence that will span forty years. Reunited decades after the tragedy, Shelly, Wyatt, and Jack will be thrown back once more to the event that changed their lives, and confronted with the lingering power of a secret none of them are ready to reveal. 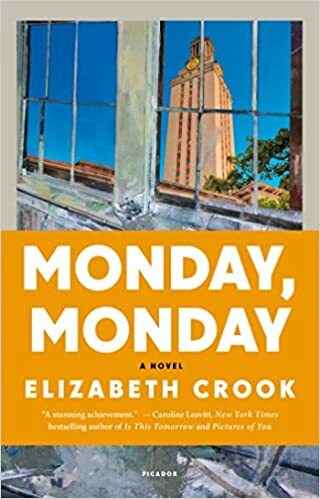 With Monday, Monday, "Elizabeth Crook has written an extraordinary novel-an eloquent love story born from an act of random violence, a tale of destruction and redemption" (Sarah Bird).